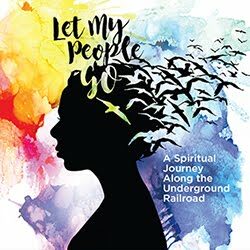 I love this movement in our city of sharing free resources. 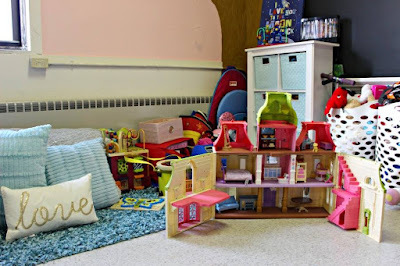 So many of us have things in our homes that maybe our children have outgrown or we simply don’t need anymore. But it might be in great shape and be useful to another family. These pre-loved items are finding new homes at Free Stores cropping up across Allegheny County. People are providing mutual aid instead of wasting resources. Free Store Penn Hills is the newest family member in this beautiful chain. 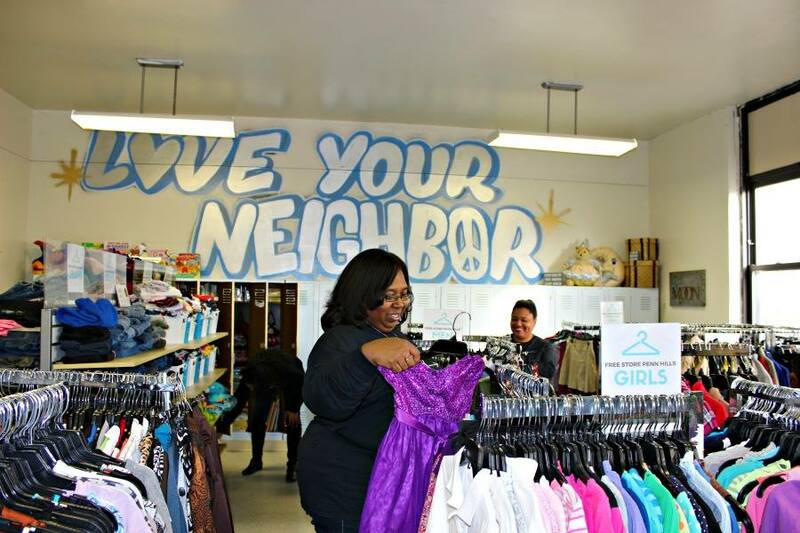 Past and present Penn Hills residents are working to eradicate suburban poverty by opening this consignment store without price tags for neighbors in need in the Lincoln Park Community Center. Starting November 19, 2016, Free Store Penn Hills will be open to shoppers and donors Mondays and Saturdays from 10 a.m. to 2 p.m. These hours are aligned with the center’s food pantry schedule, which operates twice per month. Shoppers from across Allegheny County and elsewhere are welcome. The store will distribute everything from clothing and books to toys and toiletries. 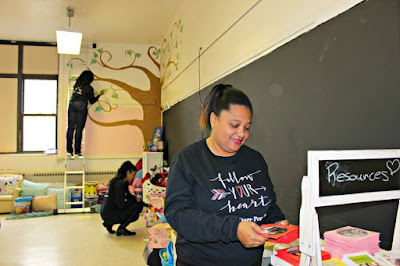 Donations accepted include, books, book bags, clothing, diapers, home décor, luggage/purses, school supplies, school uniforms, toiletries, toys and games. Due to safety concerns, Free Store Penn Hills is unable to accept cribs, car seats, furniture or other items subject to a recall. Personal items, including bedding, pajamas, toiletries and undergarments, must be in new packaging. 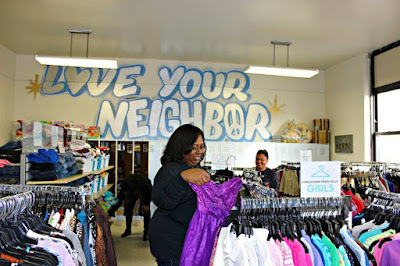 The theme of Free Store Penn Hills is to Love Your Neighbor. This quote is even painted on the store’s back wall! In our family, we try to teach our children to love their neighbors by performing random acts of kindness. For the past 3 years, we’ve participated in the Foster Love Project’s placement bag drive. [Full disclosure: I am also the founder.] Each year, we love and support children who face difficult challenges in their family life with our volunteer work with Foster Love Project. Kids that need to be removed suddenly from their homes for safety concerns, often aren’t able to take their belongings with them. And if they do take some belongings, they are often placed in a trash bag. We believe this sends the message of being disposable. And that is why these placement bags are so valuable. Yes, they take time, effort, and money, but the need to show them their dignity and worth is worth it all! They need to know that they are not just a number in the system. My kids have a had a big role in this endeavor whether it's packing bags, hauling bags or delivering packages to foster families. Free Store Penn Hills also sought to create a space that gave shoppers a sense of dignity and respect. To do so, they teamed up with At Home’s newest store in Pittsburgh located at 3000 McIntyre Square Drive. The 91,000 square-foot retail destination allows customers to affordably turn their house into a home, and the major donation allowed Free Store Penn Hills to create a warm, welcoming space. Fellow Penn Hills alum and HGTV Design Star Finalist Luca Paganico offered his styling expertise. Highlights of the store include a children’s corner, where kids can attend story time and participate in arts and crafts classes. They can also interact and add their art to the murals painted by local artists JaQuay Walker Taylor and Deborah McKenzie. A resource table will be a fixture in Free Store Penn Hills, providing valuable and timely information to the public. Here’s how your family can commit a random act of kindness. Come out to meet your neighbors on Saturday, November 19th at 10 a.m. at the Lincoln Park Community Center. Following the dedication ceremony, drop off donations, shop the store or enjoy refreshments provided by The Cupcake Crew and Frankstown Road Giant Eagle. The Consumer Health Coalition and Healthy Together Mascot Enroll-o-bot will be on site to help families enroll in quality, affordable health insurance. Children’s activities include arts & crafts, a face painter and stories--books provided by Reading is Fundamental (RIF). 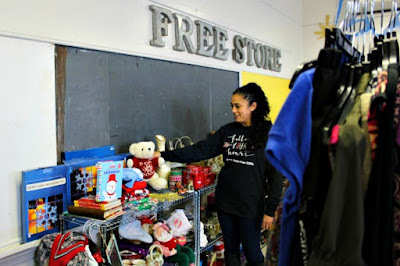 Free Store Penn Hills distributes everything from clothing and books to toys and toiletries. Solicited donations include books, book bags, clothing, diapers, home décor, luggage/purses, school supplies, school uniforms, toiletries, toys and games. Due to safety concerns, we’re unable to accept cribs, car seats, furniture or other items subject to a recall. Personal items, including bedding, pajamas, toiletries and undergarments, must be in new packaging. 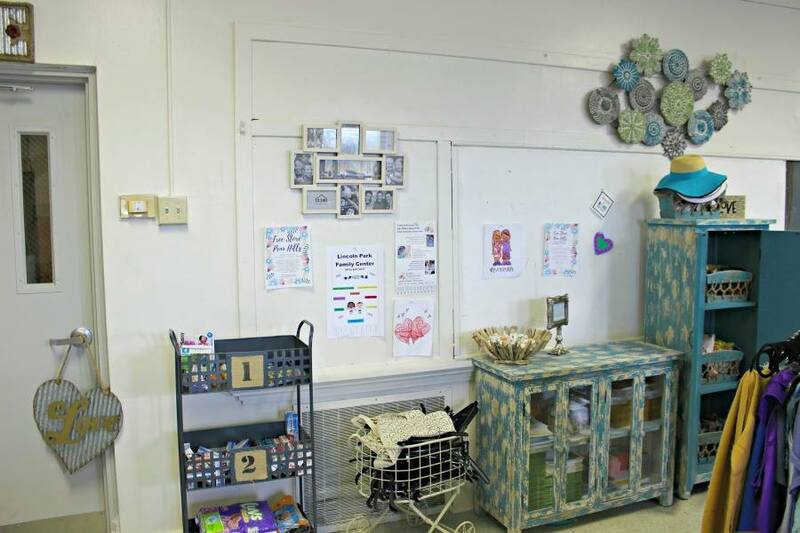 On Saturdays, the store will host the Confident Kids Craft Club. They need the community’s support to purchase art supplies. Click here to buy something from their Amazon Wish List. Free Store Penn Hills will also offer interactive and educational workshops for families, such as financial literacy programs and breastfeeding information sessions. Interested facilitators can contact Heather at dearmomdiary@gmail.com. 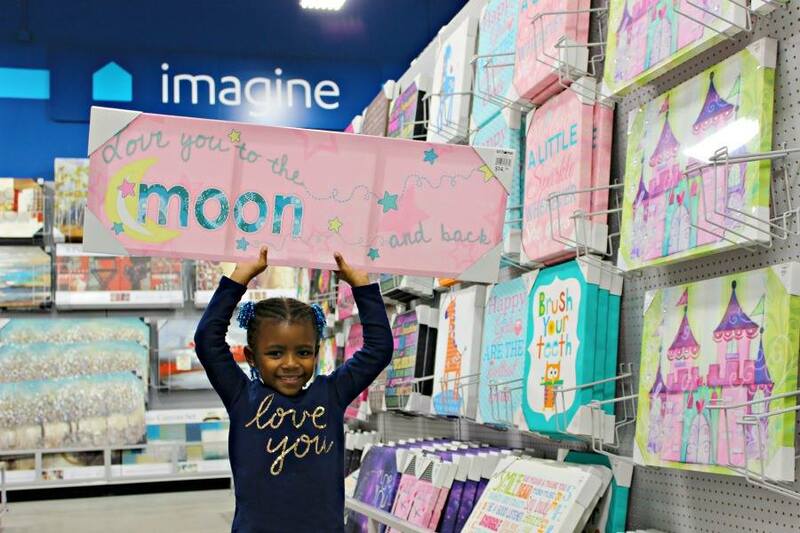 The ribbon-cutting ceremony for At Home’s Pittsburgh store will take place Friday, November 18 at 9 a.m. You can add a gift card to your holiday shopping list to donate to Free Store Penn Hills, or pick up one of the 50,000 unique items to make the holidays a bit brighter for a neighbor in need. Momtourage friends - How are you committing acts of kindness with your family? This post is sponsored by At Home so I received compensation or products in exchange for my promotion. All opinions remain my own as I don't endorse companies that I don't value. What a great idea! I was just wondering, when is the grand opening? The article says Sunday the 19th. But the 19th Saturday. So is the Grand opening on Saturday the 19th? Or on Sunday the 20th? Thanks!